Children with untreated hypertension have a high risk of developing target organ damage and cardiovascular complications later on in life. The currently accepted threshold for the definition of hypertension in children is a blood pressure above the 95th percentile or >140/90. Recent reports suggest, however, that the risk of target organ damage and cardiovascular morbidity is already increased at lower than hypertensive blood pressure levels (90–95th percentile or 120–140/80–90) which are labelled as high-normal blood pressure or prehypertension. Similarly to established hypertension levels, high-normal blood pressure in children is likely to persist into adulthood (tracking) or convert into overt hypertension. On the other hand, high-normal blood pressures may return to normotensive values during follow-up. The intrinsic long-term blood pressure variability underlines the need for repeated BP measurements over time. 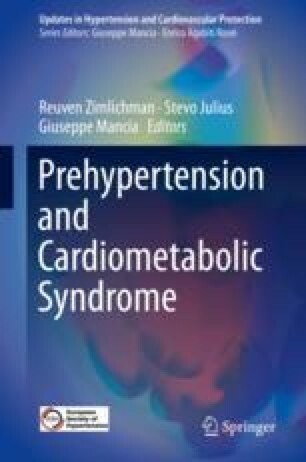 Consistently high-normal blood pressure/prehypertension may be an indication for the need for early workup of target organ damage and at least non-pharmacological treatment. However, in case of subclinical target organ damage early pharmacological may be considered.